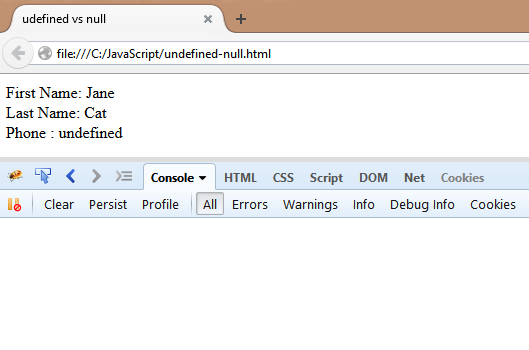 undefined : no value has been defined, usually this means that a variable or object has not been defined or declared before you use it. undefined Example: In the example below we are going to examine the "undefined" value, and try to recreate some of the scenarios that an "undefined" value will be returned. In the code above we assigned the value of the "city" property to "null" so when we display the properties of the person object we get the following values in the browser. You might have noticed that we actually assigned a value to the "city" property to be null. So null works similar to a database null, where you want to assign a default value of null to a variable or property. Whereas an "undefined" variable or property occurs in most cases when you have a brain freeze and forgot to declare a variable/property/object before you use it. 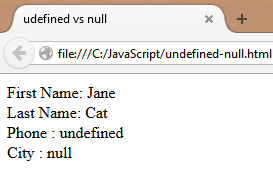 If you understand the difference between "undefined" and "null" values, you can use it to your advantage. You can think of it as exception handling without the errors.